Women can still have healthy babies who is having diabetes during pregnancy time. But first let me describe why some women get diabetes during pregnancy? 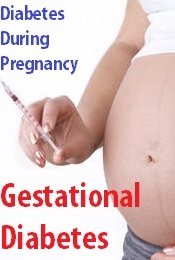 Diabetes during pregnancy is called gestational diabetes.It occurs for the first time when woman get pregnant and who were not diabetic before but have high blood sugar levels during gestational period(GD). It affects about 4-5 % of all pregnant women. Signs and symptoms are not noticeable or symptoms may be mild but not life threatening to the pregnant woman. After delivery the blood glucose level usually comes to normal.Even so then it is an early sign that she has developed a greater risk of diabetes later in her life.